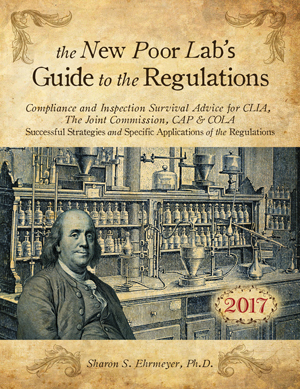 Westgard QC is proud to announce the publication of the 2017 edition of Dr. Sharon S. Ehrmeyer's book, The Poor Lab's Guide to the Regulations. Download the Foreword by Dr. Westgard, Preface, Table of Contents, Index and chapter excerpts of this book. More than 250 years ago, one of the founding fathers, Benjamin Franklin, published a yearly almanac that contained a collection of useful information and advice for the American colonists. Titled Poor Richard's Almanack, it was one of the first bestsellers of America. For decades, Franklin's almanac provided indispensable advice and encouragement to struggling settlers in the new world. Summoning that spirit, Dr. Sharon S. Ehmeyer has written The Poor Lab's Guide to the Regulations, a plain-language discussion of the rules, requirements and regulations that govern medical laboratories, with a focus on US medical laboratories. Achieving and maintaining compliance isn't an easy task. But with the new Poor Lab's Guide, getting the right advice is very easy. 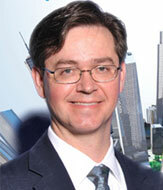 With the Risk Management Era now upon us, EQC is dead, and IQCP is the new law of the land. Finally, the updated requirements of the Joint Commission, College of American Pathologists, and COLA are explained. More than ever, the Poor Lab's Guide is an essential compliance tool for laboratories large and small. Sharon Ehrmeyer, Ph.D., MT(ASCP), is Professor of Pathology and Laboratory Medicine and Director of the Clinical Laboratory Science/Medical Technology Program at the University of Wisconsin's Medical School in Madison, Wisconsin. She currently is the secretary for AACC's POCT Division and completed a 6-year term on the Board of Directors for CLSI (formerly NCCLS) and the chairmanship of AACC's Government Relations Committee. Dr. Ehrmeyer's research areas focus on laboratory quality issues, laboratory regulations impact on laboratory practices, and POCT. She has written numerous book chapters and journal articles and has presented these interests nationally and internationally. For decades, Dr. Sharon S. Ehrmeyer, Ph.D., has been guiding laboratories in their compliance efforts. She speaks frequently on CLIA, CAP, The Joint Commission, and COLA. She is an expert at decoding bureaucratic jargon and translating it into easily-understood tasks. Her down-to-earth tips and pragmatic advice have made her a favorite at conferences around the world. Now all of her recommendations (and more) are available in this reference manual.